Fundraise, hand out, or turn a profit on customized pocket Constitutions. Perfect for campaigns, organizations, businesses, or patriotic Americans! If you like the content of ‘I Choose Liberty’ or ‘Winning’, but would like to fundraise, hand them out, or turn a profit, this option is perfect for you, your campaign, or organization. - Select Book: ‘I Choose Liberty’ = 96 pgs, ‘Winning’ = 128 pgs. - Front Cover: your name and logo. - Back Cover: your name, paragraph, and website. - Header: your website will be printed on every page. - Custom Content: select ‘I Choose Liberty’ and write 8 pages at 250 words per page. Select ‘Winning’ and write 2 pages at 250 words per page. Exceptions allowed for 2 additional pages. - Editing: includes editing and format services. - ISBN / Bar Code: we will purchase and register both. - Purpose: you can sell, fundraise, or give away the books. - Fulfillment: we can provide fulfillment services with an additional agreement. 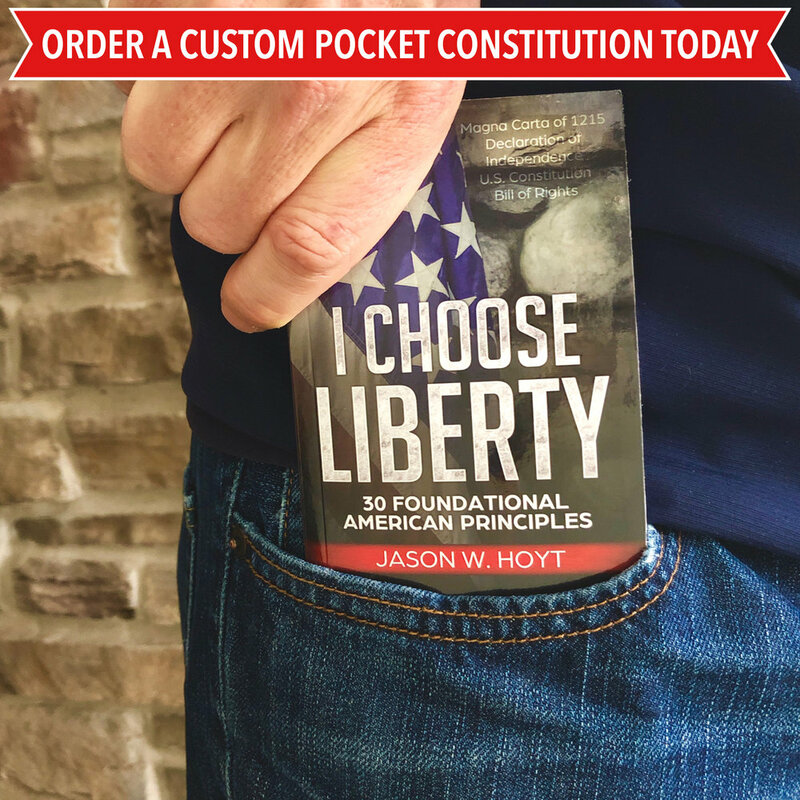 If you want to promote Liberty and the Constitution and have a set of principles or important information to communicate, this option is perfect for you, your campaign, or organization. - Front & Back Cover: a unique cover will be designed. - Author: you or your organization will be listed as the author. - Custom Content: write 42 pages at 250 words per page. - Included Sections: 1215 Magna Carta, Declaration of Independence, Signers of the Declaration, U.S. Constitution, Bill of Rights, Amendments 11-27 and Notes on Modifications. Thank you! I’ll get back to you as soon as I can. In the meantime, connect with me @JasonWHoyt on most social media platforms.